A Saudi man who boasted about his sexual conquests on an Arabic TV station has tearfully apologised, as calls mounted for him to be punished. Mazen Abdul Jawad talked about his sexual conquests, starting with a neighbour when he was 14, and how he picks up women in the kingdom. Saudi media say officials are considering whether to charge him. These rules are flouted by locals as well as expatriates, but almost everyone who breaks the rules keeps quiet about it and hopes they won’t be found out. So it is unusual for a Saudi man to appear on TV freely discussing the ways in which he has transgressed the Saudi code. Mr Abdul Jawad agreed to be interviewed for the Red Lines show on the popular Lebanese TV station, LBC. The show deals with taboos in the Arab world. Mr Abdul Jawad talked openly about his sexual conquests, starting when he was 14. He also described how he used the Bluetooth function on his mobile to meet Saudi women. Religious authorities have tried to ban such devices for this very reason. Complaints have now been filed against Mr Abdul Jawad in his local court and online Saudi forums are full of denunciations of his behaviour. He says he is considering suing LBC for misrepresenting his views. The owners of a Saudi Arabian oil tanker hijacked by Somali pirates are negotiating a possible ransom, the Saudi foreign minister has said. 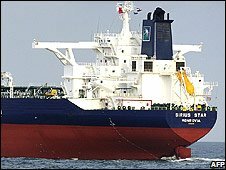 The Sirius Star is the biggest tanker ever hijacked, carrying a cargo of two million barrels of Saudi oil – worth more than $100m (£67m). Saudi’s Prince Saud al-Faisal did not confirm whether a ransom was likely to be agreed, but said talks had begun. Meanwhile, the Indian navy says it has sunk a suspected pirate “mother ship”. INS Tabar sank what was believed to be a Somali pirate “mother ship” after it failed to stop for investigation and instead opened fire in the Gulf of Aden, an Indian navy statement said. The captive crew on the Sirius Star include two British citizens, two Poles, one Croatian, one Saudi national and 19 Filipinos. The Britons include Peter French, the chief engineer on board the vessel. The other is Second Officer James Grady, from Strathclyde. Their families released a statement on Wednesday saying they hoped they would be home safely very soon. There has been a surge in piracy incidents off the coast of Somalia during 2008. On Tuesday, a cargo ship and a fishing vessel became the latest to join more than 90 vessels attacked by the pirates this year. The pirates who seized the MV Sirius Star and its 25 crew on Saturday are a sophisticated group with contacts in Dubai and neighboring countries. Much of their ransom money from previous hijackings has been used to buy new boats and weapons as well as develop a network across the Horn of Africa, he adds. Asked whether a ransom was being negotiated, the Saudi foreign minister said the decision rested with the owners of the tanker. “We do not like to negotiate with either terrorists or hijackers. But the owners of the tanker, they are the final arbiters of what happens there,” Prince Saud al-Faisal said. 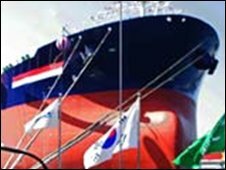 The tanker’s Dubai-based operators, Vela International Marine Ltd, would not confirm or deny negotiations were taking place. “Given the sensitive nature of the situation, and to ensure the safety of the crew members, we are not prepared to make any public statement on this issue,” a spokesman told AFP. The UK Foreign Secretary, David Miliband, said piracy was “a scourge wherever it appears anywhere in the world and at the moment the scourge is focused in the Gulf of Aden”. He said the Royal Navy was co-ordinating the European response to the incident. Shipping companies are now weighing up the risks of using the short-cut route to Europe via the Gulf of Aden and Suez canal. However, travelling around South Africa’s Cape of Good Hope would add several weeks to average journey times and substantially increase the cost of goods for consumers. The deadly car bombing outside the US embassy in Yemen represents an escalation in attacks against Western targets and shows al Qaeda-inspired jihadis are growing in ability and determination. Islamic Jihad has claimed responsibility for the attack, which killed at least 16 people, but it is possible that other groups will come forward in the next few days. There is a complex network of over-lapping splinter cells and claims of rival leadership within Yemen. Extremist violence in Yemen has been on the rise since February 2006, when 23 prominent militants tunneled their way out of a high-security jail. Ten Europeans and four Yemenis have died in attacks on tourist convoys in the past 15 months. In March, a misfired mortar strike hit a girls’ school next door to the US embassy by mistake. 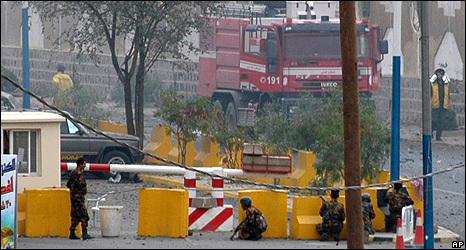 A subsequent bombing campaign in the capital – against an expatriate residential compound and oil company offices – prompted the US state department to evacuate all non-essential embassy staff from Yemen. US employees had just started to return to their embassy desks at the end of August – so the timing of the latest attack is significant. During July, Yemeni security forces killed five al-Qaeda suspects, disrupted a second cell and arrested more than 30 suspected al-Qaeda members. In August, a prominent Islamic Jihad figure was arrested. But this attack shows that effective leadership remains intact and operational capacity has not been disrupted. Two Saudi passports were found among documents seized in the July raids and interrogations were said to have uncovered plans to launch attacks in Saudi Arabia and Yemen. Yemen subsequently extradited eight Saudi nationals to Riyadh. The raids underlined the importance to Saudi Arabia of Yemen’s internal security. But Yemen is also paying the price for the northern kingdom’s muscular clampdown on its own insurgents. In March, a Saudi militant fundraiser said al-Qaeda had been defeated in Saudi Arabia and he called on his remaining associates to flee to Yemen to escape capture or assassination by the Saudi authorities. The current migration of Saudi jihadis to Yemen coincides with the emergence of a transnational structure calling itself al-Qaeda in the South of the Arabian Peninsula. Yemen’s mountainous terrain and the weak presence of state structures outside Sanaa have long fostered close ties between jihadis in these neighboring states. Cash-strapped Yemen lacks the financial resources to tackle terrorism in the same robust manner as the Saudis; its per capita gross domestic product of $2,300 is dwarfed by the $23,200 seen across the northern border. In recent years, the Yemeni government has pioneered a dialogue programme and poetry recitals to influence violent jihadis and tribesmen. The most recent initiative is a two-hour feature film intended to educate the public about Islamic extremism. The film, called The Losing Bet, follows two Yemeni jihadis who return home after being radicalized abroad. They are directed by an al-Qaeda mastermind to recruit new members and carry out a “martyrdom operation”. News footage from the aftermath of a real suicide bombing is edited into scenes of this creative new drama – written and produced by a popular Yemeni director. The film was launched in August, at a five-star hotel that has previously been an intended target of foiled terrorist plots. It comes as the government faces a new generation of violent Islamists who are blowing the old, inclusive consensus apart. The young generation appears to be immune to the standard tactic of negotiation and compromise that President Ali Abdullah Saleh used with the Yemeni mujahideen who returned home at the end of Afghanistan’s war against the Soviet Union. The Afghan veterans supported the northern tribes against the former socialist South Yemen during the 1994 civil war in return for a reputed “covenant of security” deal – where the government guaranteed protection inside Yemen as long as violence occurred outside the boundaries of the state. But new recruits are actively targeting President Saleh’s regime, citing as provocation the torture and humiliation of captive al-Qaeda members. In July, a suicide bomber blew himself up outside a police station in Hadramaut. In a subsequent statement, a splinter cell pledged to continue attacks against security and intelligence structures. Such an explicit declaration means there is no longer scope for dialogue, according to Ahmed Saif, director of the Sheba Centre for Security Studies. “The government is moving to a policy of direct confrontation with the younger generation,” he says. The most senior judge in Saudi Arabia has said it is permissible to kill the owners of satellite TV channels which broadcast immoral programs. Sheikh Salih Ibn al-Luhaydan said some “evil” entertainment programs aired by the channels promoted debauchery. The judge made the comments on a state radio program. He was speaking in response to a listener who asked his opinion on the airing of programs featuring scantily-dressed women during the Muslim holy month of Ramadan. “There is no doubt that these programs are a great evil, and the owners of these channels are as guilty as those who watch them,” said the sheikh. Given his position as the country’s most senior judge, the sheikh’s views can not be easily dismissed. Clerics like Sheikh al-Luhaydan represent a huge dilemma for the Saudi royal family, our correspondent adds. On the one hand, Saudi rulers need their support to claim that they rule in the name of Islam. But on the other hand, fighting militant Islam can be difficult when the country’s top judge calls for the beheading of those he views as immoral broadcasters. Oil prices have risen to $104 a barrel in Asian trade, reversing earlier losses, after OPEC agreed to return to its late 2007 production levels. After talks in Vienna, Opec president Chakib Khelil said the measures to curb over-production amounted to a cut of 520,000 barrels a day within 40 days. The October US light crude future was up about $1 to $104.20 a barrel after earlier tumbling to near $102. Prices have sunk from a record of more than $147 a barrel seen in July. On Tuesday Brent crude had dropped beneath $100 a barrel for the first time since April, and crude prices remain close to $100, below which Goldman Sachs said earlier this week could signal a global recession. The fall from the record prices in July has helped the US dollar, which hit an 13-month high against the euro on Tuesday. The price has since fallen by nearly 30% as a global economic slowdown has reduced demand for oil. Supply has also been increased in recent months by some Opec members – principally Saudi Arabia. Meanwhile, Indonesia has suspended its membership of Opec. “The conference regretfully accepted the wish of Indonesia to suspend its full membership in the organisation and recorded its hope the country would be in a position to rejoin the organisation in the not too distant future,” Opec said in a statement. After the late-night talks in Vienna, the group announced it had decided to “strictly” comply to the production ceilings agreed in September last year, which amount to 28.8m barrels a day excluding Indonesia and Iraq. It linked the falling price of oil to slowing economic growth, a stronger US dollar, easing geo-political tensions and greater supply. “All the foregoing indicates a shift in market sentiment causing downside risks to the global oil market outlook,” a statement said. The effect of the measures will be a cut of about 520,000 barrels a day, according to Algerian Oil Minister Chakib Khelil, who chaired the meeting. “Actions [to curb output] will be taken by members as soon as they can, that means in the next 40 days,” he said. 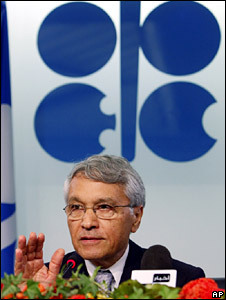 Opec members will re-assess the situation when the meet again at the end of the year. The move is a compromise meant to avoid new turmoil in the oil markets, but it also reflects Opec’s attempts to stop the recent falls in global prices.